Have you heard these comments at your dinner table? Do your kids claim they are starving, but refuse to even look at what you’ve prepared? Do they steal and hoard food? Do they binge, never having a self-awareness of when they are full, and vomit as a result? You are not alone! Parents of typically developing, biological children fight these battles, but parents of children who have been adopted, who are in foster care, or who have special needs see these issues amplified. Not only are these difficulties rampant in certain groups of children, but foster and adoptive parents are told by professionals that food and eating issues should never be a battleground. Even more so than biological children who have been nurtured with good nutrition before and after birth, kids from traumatic beginnings often fight malnutrition, slow growth, absorption problems, and more! As foster and adoptive parents, we long to nourish these children physically, but they fight us every step. With kiddos in our house who were very malnourished, I became the master at sneaking in nutrition in any way I could. Protein powders, fiber, and vitamins went in smoothies. Vegetables went in pasta sauce, brownies, muffins, meatballs, and more. Eating is not solely about nutrition. It is cultural and social. 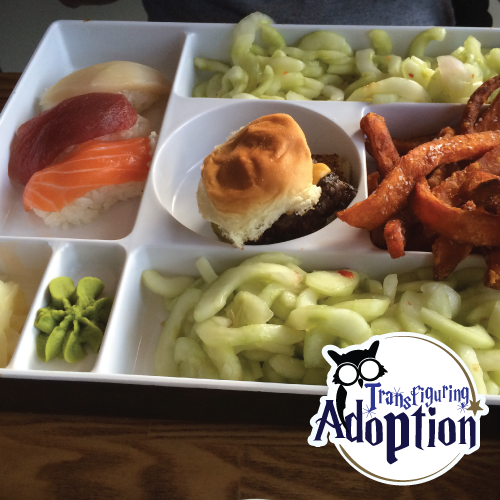 We love to travel, and we wanted our children to find a sense of adventure when it comes to food and travel. We also desire for them to learn the social skills of being gracious guests whether with our friends or family or on an overnight at a friend’s house. We also wanted them to develop an understanding that turning down food is perceived differently in different cultures and that tact is required to not hurt others’ feelings when they have worked hard to prepare food that you don’t like. While I was mastering nourishing the kids, we were still struggling with getting them to try new things, and frankly, I could not eat another hot dog or can of baked beans. Darren and I collaborated on a two part idea. 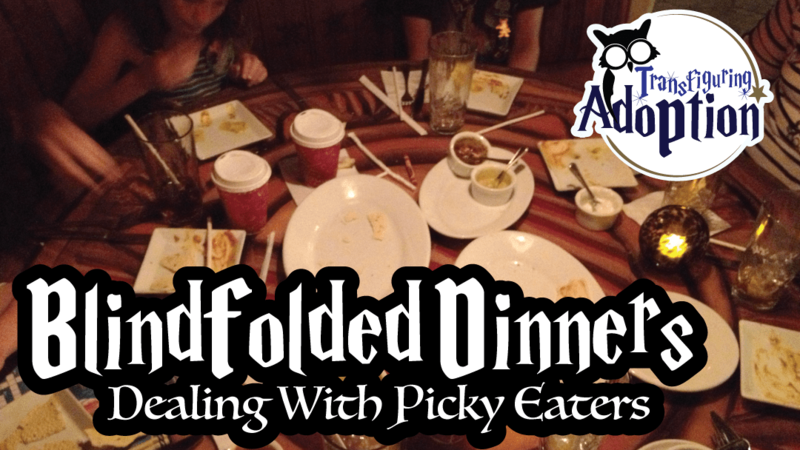 First, we would present a new food, but only after everyone was wearing a blindfold. This helped eliminate decisions about taste based on how a food looks. It also made eating a family adventure. They saw it as a game and became willing participants in food experimentation. Food journals comprised the second part of the adventurous experiment. After we tried a meal as a family, each of the kids had a decorative journal where they recorded the name of the meal and either words or pictures (depending on their developmental level) to describe how they felt about it. It gave us a great reference to look back at when deciding whether or not to cook a meal again. Our formerly pickiest eater, who ate only hot dogs, food out of cans, and junk food, now regularly declares I am the best cook in the world. 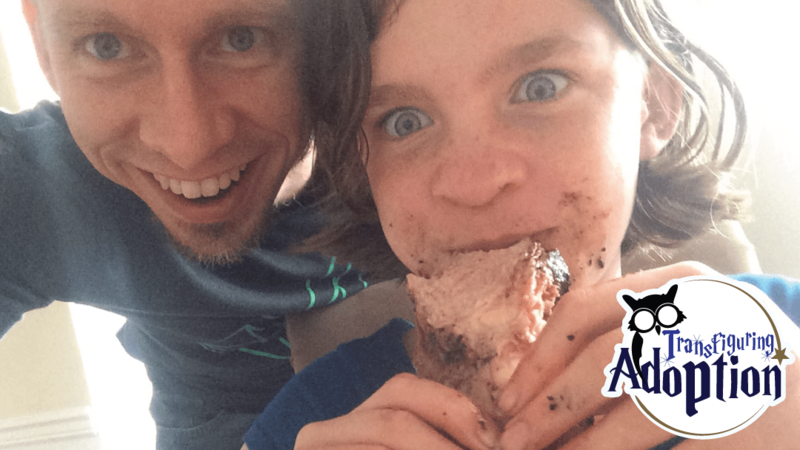 During our adoption celebration vacation, he tried curried lamb and loved it. His taste buds have become so expanded, and he willingly tries new things. While he is not a fan of sushi or seafood, two of the others share my love of both! We rarely have issues getting the kids to try new foods, and they will eat whatever is put in front of them, whether they love it or not, though they may pick at it for a while. We no longer use the blindfolds or food journals, but the kids still talk fondly of those days, they still have their journals, and they occasionally ask if we can do it again. 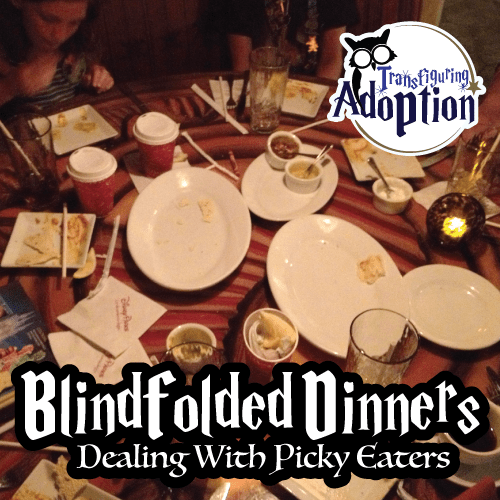 Making mealtime a fun, family adventure changed the dynamics at the dinner table and what and how our children eat. What difficulties have you had with food in your home? 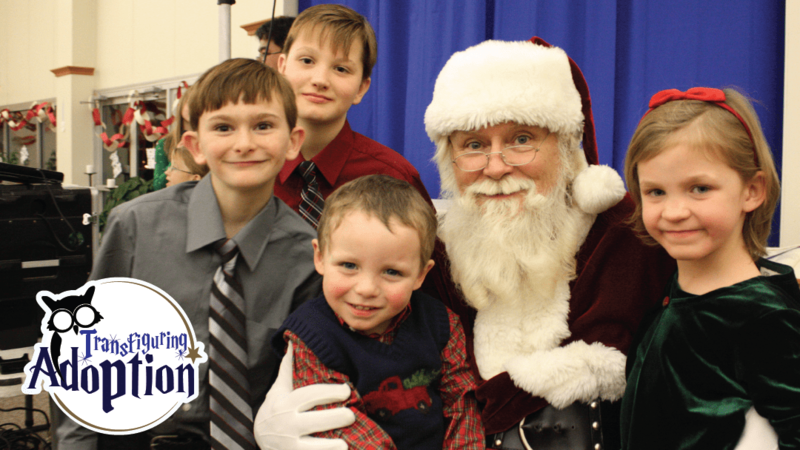 Christmas and holiday traditions for foster and adoptive families can be wonderful opportunities to connect with your child and communicate their importance to family. 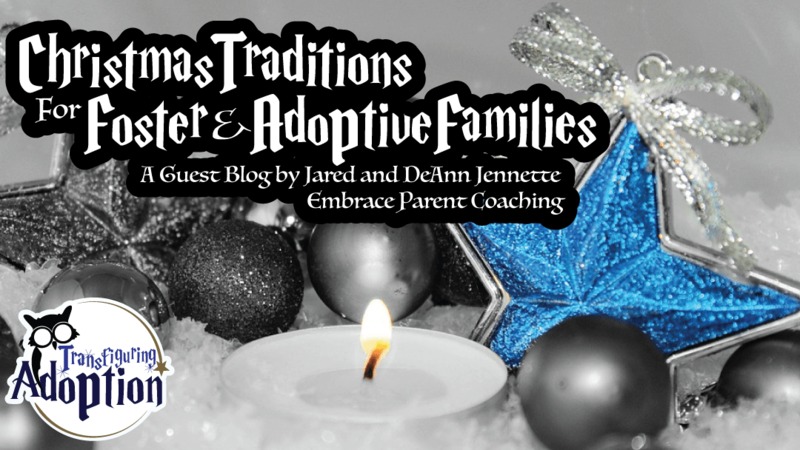 If we are not willing to incorporate our children’s traditions into the life of our family, we communicate to our foster/adopted child that they are an outsider who needs to conform. This will likely lead to a child feeling excluded and rejected. 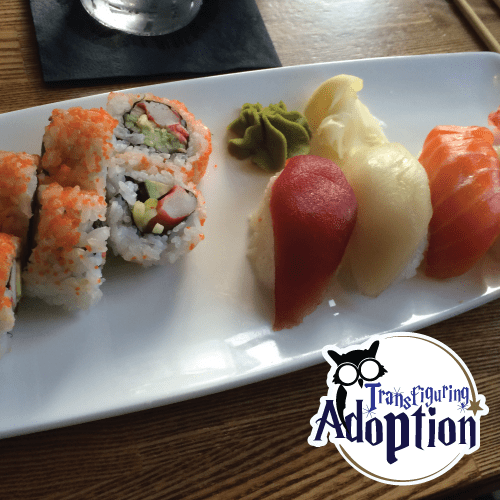 So how have we created new traditions as an adoptive family? You may not be a transracial foster or adoptive family, but that doesn’t mean there aren’t ways for you to acknowledge your child’s heritage as well. Are there ornaments that are important? Decorations to remind him/her of their biological family? Help them celebrate by incorporating them into the family. 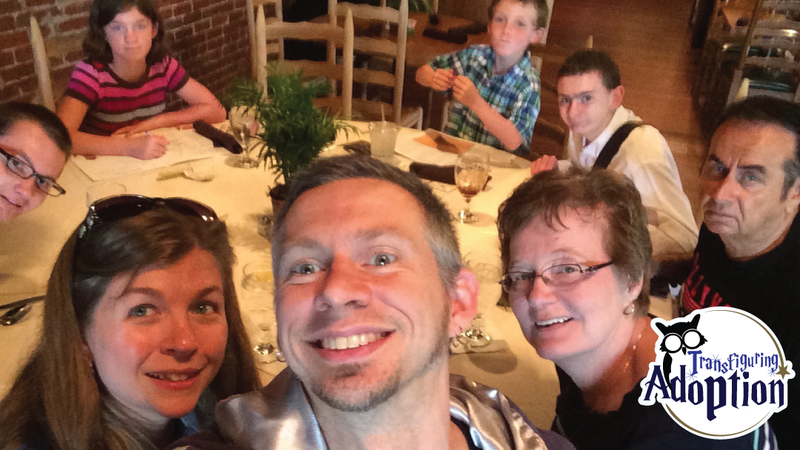 When we were first married, we had to decide what new family traditions we would create. Where would we be for Christmas eve? Christmas morning? 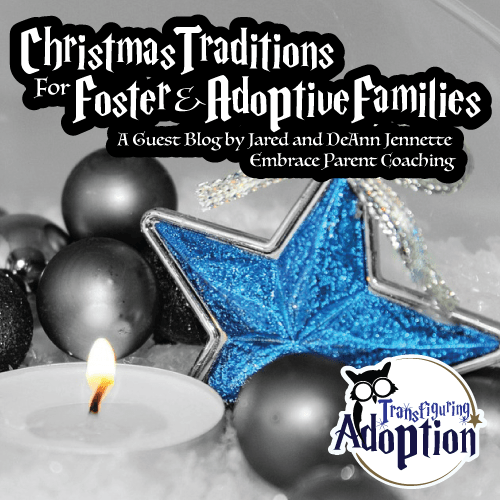 When we foster and adopt a child, we need to take the same approach and be willing to create new holiday traditions, even if it means letting go of others that we hold dear. For us, this meant making New Years a day of celebrating Haitian Independence Day. We have tried our hand at joumou soup, a pumpkin soup that is often had to celebrate. Once we realized we were terrible at making it, we found a Haitian restaurant in Evanston, IL, about an hour away. Every year we order food to have at home on Haitian Independence Day. We’ve even shared this with our extended family to invite them to be a part of the celebration. Ask your child what’s important for them during the holidays and make it important to you. Send a card with a personal note from your child. Take your child to purchase a gift for a sibling or parent. These are just a few ways that we hope spark ideas for you. 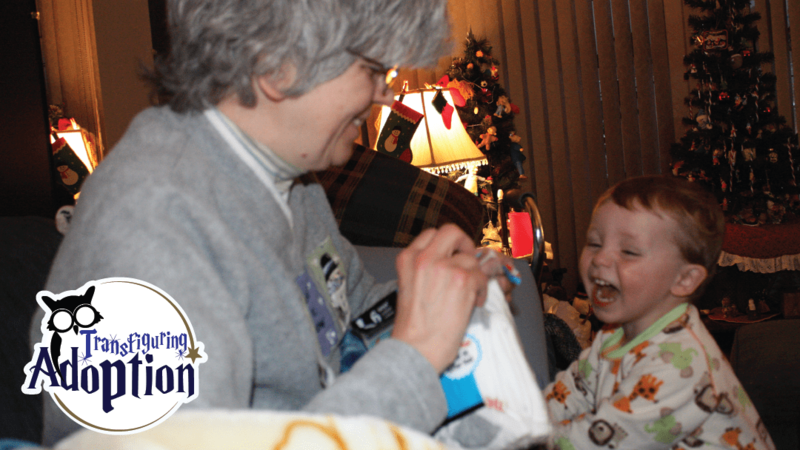 The more you’re able to include your child’s birth family, the happier your holidays can be. Keep in mind that holidays may be very emotionally overwhelming for your child. Don’t put pressure on yourself or your child for a “perfect” holiday. Look for ways to create new traditions, including your child’s biological family, to create a chance at a happier holiday. The last few months have flown by, and I cannot believe the holiday season is upon us! 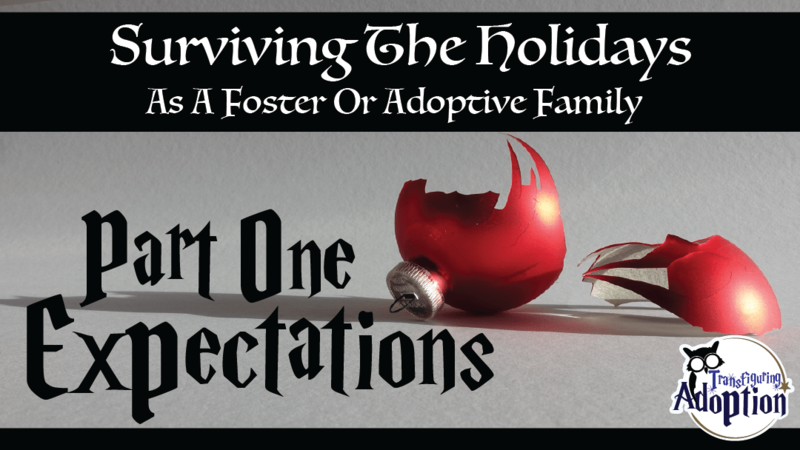 The holidays can be an extremely challenging time for foster and adoptive families. Not only do we get out of our usual routines, which is hard on our kids, but the holidays come with multiple confusing and complex emotions for everyone in the family to process. Excitatory chemicals released in the brain are the same during both traumatic and joyous experiences. Therefore, meltdowns, temper tantrums, withdrawal, and more are pretty well to be expected unless you are very intentional about putting into place safeguards to prevent such events. Today is the first of a 5-part series about ways we have found over the years to confront the challenges the holidays present. 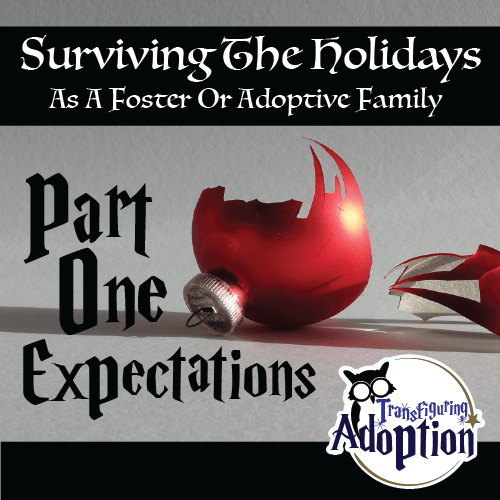 I recently was at a conference during which the main speaker said something so important which I will blog about in depth soon in regards to fostering and adopting but which is also vital to the discussion of holidays as well. Beth Guckenberger, cofounder of Back2Back Ministries, stated that “Expectations equal premeditated resentment.” When our expectations are not met, the emotions are certainly difficult to deal with, and this leads to resentment of all sorts. For kids who have not totally learned how to deal with their emotions or who do not even fully know what emotions are or how they affect them, undesirable behaviors are sure to result which can set off a chain of downward spiraling events. The holidays are a time when desires and longings, along with expectations (whether good or bad), are often at the forefront of our minds. I, even as an adult, tend to always have expectations for how a holiday, vacation, or big day should be. I picture it in my head. Kids also have expectations for how holidays should be. They may think that because they ask for a gift, they will automatically get it. They may have an idea of the schedule for the day in their head which they may have created or assumed. They could expect to see certain people. When I have a picture of a special day with family in my head that gets sabotaged by a behavior, I find myself struggling. A true perfectionist, I often find myself stuck, staring at the picture of my perfect day which exists in my head and focusing on what I long for life to look like. This results in anger and ultimately resentment, which ends in conflict and not quite the bonding experience we all long for holidays and other big days to be. For our kids, they may not even know and be able to process what’s happening when they have unmet expectations, but their behavior shows it! The best way to deal with behaviors caused by unmet expectations is to prevent expectations from being unmet in the first place, and the only way to do that is to find out what everyone’s expectations are. Sit down before special days and discuss what everyone thinks will happen. We all need to be realistic and help our kids be realistic about what to expect. Not everyone will show up to a party. You won’t get everything on your wish list. We can’t ride every amusement park ride before one of the kids is just “done” for the day. A child with special needs or trauma may not be able to keep themselves regulated for a whole party. Those really large get togethers may be too much for our kids, so we may not make it to desert or to midnight on New Year’s Eve. Try to stay as near to normal routines as possible. Kids who have been adopted or are/were in foster care do the best when they are in a consistent routine. They know what to expect, feel a little control over their life, and in return, are able to exercise better control over their behavior. We learned early on that keeping our kids out or up later than their bedtime is usually not worth it. We WILL pay for it later. Some rules/boundaries move a little during special days, but we try not to change too much up because, again, we pay for it. It confuses the kids when rules/boundaries are not consistent. There are days when we feel sad/frustrated/angry/whatever because we see other families and friends with their “typical” kids enjoying special days in ways we can’t as a family, but it’s important to remember that this stage in our kids’ lives is temporary. One day (maybe when we’re in an old folks’ home) we’ll be able to celebrate holidays in more “typical” ways. For now, you may have to watch a New Year’s celebration in another part of the world where they are hours ahead, and you can bang pots and pans or do some quiet celebratory action if you have kids who can’t handle loud noises, pretend it’s midnight (because it is somewhere!) and send the kids on to bed. The more we help our kids feel safe and help them succeed in social situations, the more likely they are to find the healing needed to see the progress needed to move back from our “new normal” as a family to what we would consider “normal” family activities. Let children know what’s coming. Children who have experienced trauma, grief, or loss often feel no control over anything. They very rarely have any say in the events in their lives. This leads to behaviors that are often rooted in their search to exercise control. Letting children in on the plans and schedule for the day helps them feel safe and know what to expect. You can do a written out schedule, a picture schedule for kids that don’t read, or little cards with activities put in the order that they will happen in (possibly with a wild card for the unexpected). Teach kids how to deal with disappointment. This is another area where preemptive action needs to be taken. When they are upset, their brain is not able to process learning. At a time when they are calm and content, discuss what to do when their expectations aren’t met, when they experience disappointment. Talk about the feelings and brainstorm ways to handle them in an acceptable manner. What do you do if you don’t get the present you wanted? What if you don’t like the sweater grandma knitted for you? What do you do if there is no more pumpkin pie left when you get to desert time? One of our most fun family vacations last year was one of our most successful because we preempted the trip with lots of preparation for what disappointments may occur. 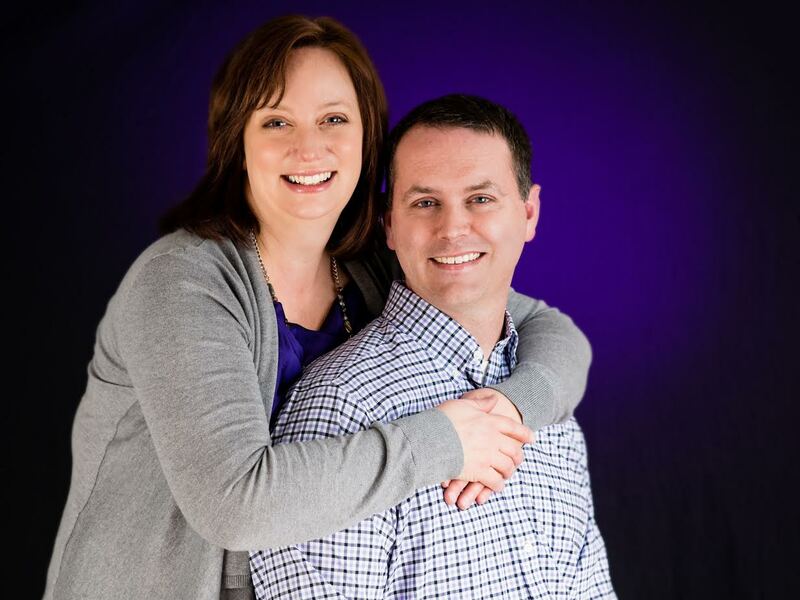 We knew it was going to be a whirlwind, and the kids would have unmet expectations. We nicknamed it the “unfair trip” and asked each one of them if they wanted to opt out and said even one dissent would end in a family decision to stay home. Everyone said they would rather go. We went over and over what things might happen that they might feel upset by and reminded them over and over that no matter what it would be more fun than staying home. We had a blast. Vacations were not always that way. We hadn’t even made it to our destination the first trip we all six made together when we thought we would never go on another vacation because nothing was happening as expected. By examining expectations, setting realistic expectations, and brainstorming ways in which kids can experience disappointment, kids will feel more prepared and will be more likely to succeed. Success breeds greater confidence and more success. And don’t forget to do this all for yourself. We can hardly ask our kids to control their emotions and disappointments at unmet expectations when we ourselves cannot! Do you find yourself having expectations for the holidays or special events, only to suffer disappointment when they don’t come to pass? What can you do to ensure you have realistic expectations? Do you ever find yourself dwelling on dreams and forgetting to live in the here and now? What do you find helps you to come back to the present? Does anyone in your house (knowingly or unconsciously) sabotage holidays or special events? Be sure to share your thoughts below. Your answers will help other kids and parents too.